KISS are a legendary rock-n-roll band that have influenced multiple generations of rock and metal musicians over a career that has spanned nearly 5 decades. They boast the largest discography within Mercury records, hold the record for most Gold albums by an American recording artist, rewrote the rules for the rock-n-roll concert stage show with pioneering theatrics, and have secured a place in the official Rock N Roll Hall of Fame. However, the members of the band are not as young as they once were and this time around they have called the tour "The End of the Road Tour: The Last Tour Ever". However, some critics claim that they have done a "Farewell Tour" once before, so why should we believe them now? That question can be debated as much as you like, but in the end, time will tell. As it always has. These questions aside, I did approach this concert as if it will be the last chance I'll ever have to see this band in concert. I've long held to the statement that KISS are my all-time favorite band. I am constantly discovering new metal bands, both on the national and local levels, so on any given day there could be a different band that I hold in the highest regard. However, when I look over the course of my music-listening life, the timing, scope, and longevity of KISS all play a role in keeping them high on my ever-growing list of favorites. So for this show I was all-in. 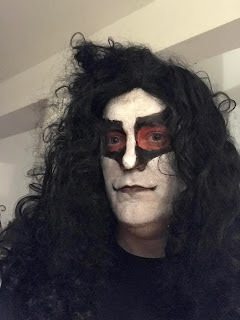 I put on my 'ultimate fan' hat, outfitted myself in KISS swag from my head to my toes, and yes, even painted my face like a member of the band (this time I chose the late Eric Carr). I left my pipe-dream hopes and expectations of any reunion with past members at the door, as I had heard enough interviews that consistently ruled that scenario out. I simply went with the hopes to see this current KISS lineup of Gene, Paul, Eric and Tommy deliver a selection of songs and performance of music that would exhibit a diverse representation of the band's long and storied career. With this as my frame of mind, I was not disappointed. By the end of the night, I was grateful to have witnessed the KISS live show for quite possibly the last time. From the moment the lights went out KISS were on a mission to give us a final performance that fulfilled a fan's expectations no matter what year they may have begun to follow this band. They opened with their classic hit, 'Detroit Rock City', descending from the rafters on stage-lifts, with laser-lights and fire balls erupting from the stage. There was no looking back from there. KISS kept the show rolling as best they could. They gave us a good mix of anthems, ballads, and heavier tunes. Early in the show, Paul Stanley said they were going to represent every era of the band. By the end of the show I can say they did a fairly good job of that. True, it is difficult to represent every era when a band has 20 studio albums (24 if you count the 4 solo albums). If I looked at their set list under a magnifying glass I could say they skipped a few albums (no 'Hot In The Shade', no 'Revenge', no 'Monster', or 'Elder', or 'Carnival of Souls'... no 'Unmasked'). But I was looking on the bright side. They covered all of their biggest hits, and best-known anthems, and with the first 'Alive' album being their most successful and possibly their best-known release, it's no surprise they still play many songs from that era. But they did perform 'I Was Made for Lovin' You' from the 1979 'Dynasty' album, 'War Machine' and 'Heaven's On Fire' from the 1980's, and 'Say Yeah' from 'Sonic Boom' (one of only 2 albums recorded by their current line-up). 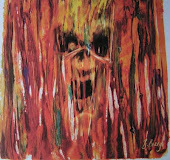 So in the end they did represent the spectrum of KISS quite well! Their classic theatrics were all there: pyrotechnics, elevating drum riser, laser light show, fireworks shooting from the guitar, and of course Gene Simmons breathed fire and spit blood at different points of the concert. 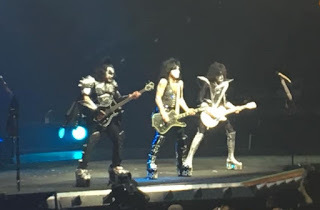 Paul Stanley rode a zip-line out to a small platform stage in the back area of the main floor to sing a couple songs- a stunt he has done for several recent tours. 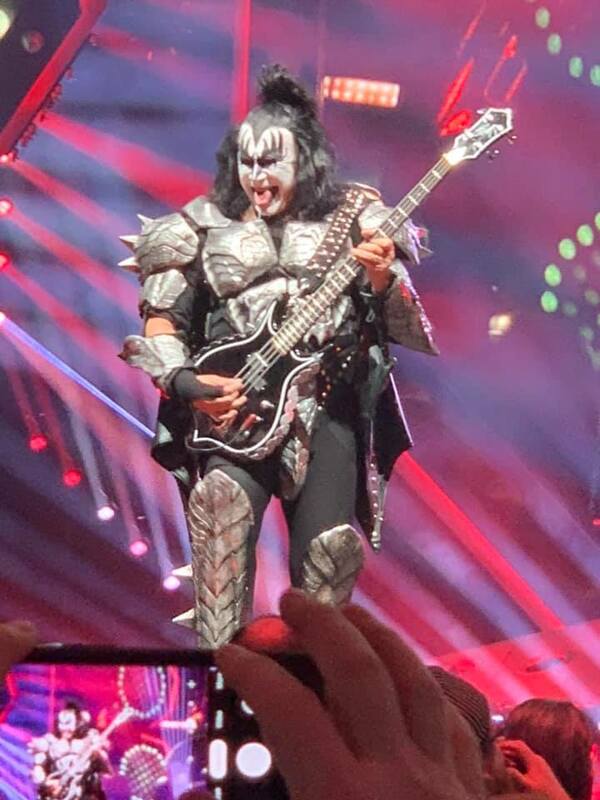 Gene Simmons was lifted to the rafters to sing 'God of Thunder'. With all of this in mind, I must say that my favorite part was when they played 'Lick It Up'. Ever since they incorporated a segment of The Who's 'Won't Get Fooled Again' into the breakdown segment of this song it has become a concert experience to behold. They did not disappoint, as they performed this song again with the extended breakdown. They closed their main set with 'Black Diamond', a classic song from their first album, and Alive! From the clean intro, the crowd participation elements, and slow closing segment of the song, the crowd went crazy right to the end. Then the lights when dim to the enthusiastic cheers of the crowd. A few minutes later it became clear that they had saved the best for last. The first song of the encore was 'Beth', sung by Eric Singer. The cool thing about this song was that for the first time in all the years I've seen KISS in concert, Eric actually played the song live on the piano, instead of singing along to the recorded instrumentation like he usually does. I only recall one other tour where they played the song live instead of singing along to the recorded music, but even then it was on acoustic guitars. This was on the piano, as the song is meant to be played. Thank you Eric Singer for making this a memorable performance! After that they played 'Do You Love Me?' and of course 'Rock and Roll All Nite'! They dropped balloons from the rafters, blew confetti into the air, lifted Gene and Tommy on cranes out over the crown on either side of the arena, and ignited a lot of pyro in the ultimate concert finale. The crowd went crazy as they finished their show with this classic anthem. It was a night I'll never forget. Thank you again to KISS for all the music and memories through the years. You let us drive you wild; we let you drive us crazy! 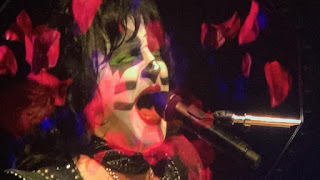 For more pics and videos from this concert on March 2nd, 2019, please visit this Facebook event link, posted by KISS, and filled with comments from the KISS Army of Chicagoland! Lastly, I wish to give a sincere thanks to those who gave permission for me to use your photos in this review. You guys rock! Happy Headbanging to all of the Kiss Army!